It's monthly favourites time! The majority of my August Favourites are new products due to my non stop shopping but they are things I've really enjoyed using and I'm so glad I bought. 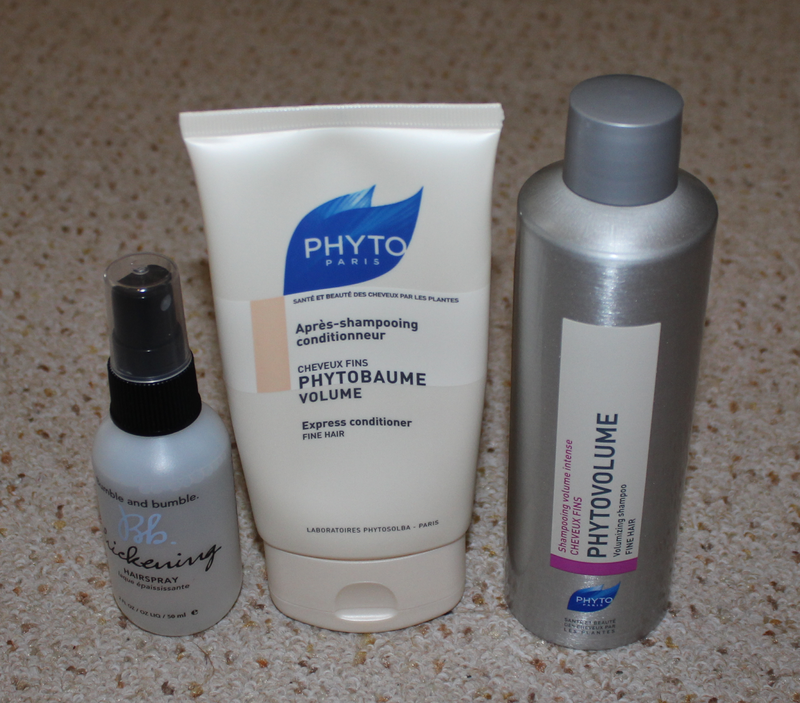 First up are my hair care favourites, the Bumble and bumble Thickening Hairspray, Phyto Phytobaume Volume Express Conditioner and Phytovolume Volumizing Shampoo. I've been loving these for adding volume and thickness to my fine hair. They really work and don't weigh my hair down or add any stickiness. I've dedicated a full blog post to those here. At the back end of July to the beginning of August, I had a lot of really bad spots on my chin which I'm putting down to using L'Oreal 15 Second Miracle Cleansing Oil which is a shame as I wanted to love it! 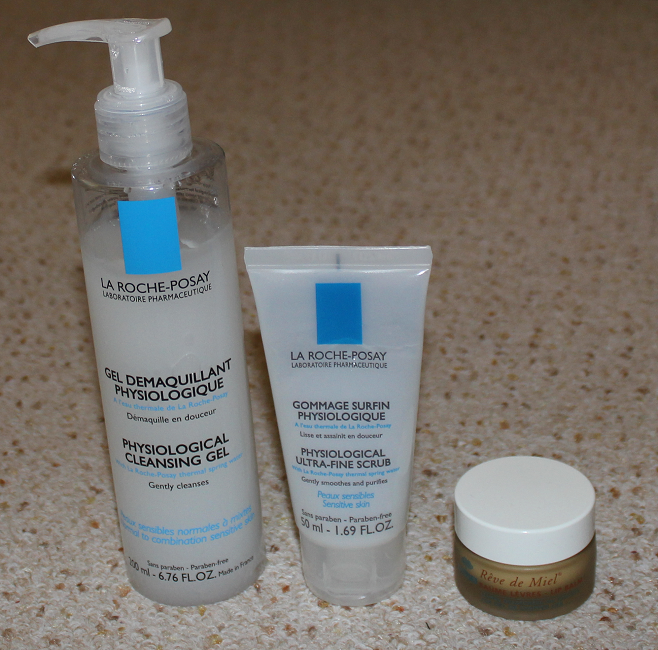 Whilst on one of my crazy lunch time Boots hauls I added two La Roche-Posay skincare products to my basket as I'd been wanting to try some more of their products since loving their Dry Touch Gel Cream from last month's favourites. I'm so glad I bought these as the Physiological Cleansing Gel has done wonders for my face! It's just a really gentle cleanser suitable for sensitive skin with no parabens, soap, alcohol or colourants. It's not a luxurious product like an Elemis cleanser or anything but it's been really good for going back to basics and using something that really cleans my skin and doesn't leave it dry, irritated or most importantly, spotty! I didn't really need a scrub as I'm still trying to use up a Superdrug one but I've really been liking the Physiological Ultra-Fine Scrub. This is another gentle product suitable for sensitive skin but it really does a great job at exfoliating too. It has really fine, salt like grains that help to reveal lovely fresh and smooth skin. I've been using this around 3 times a week and in conjunction with the cleanser my skin is looking so much better. My spots have cleared up and my skin is looking more healthy and radiant again. I definitely need to try more of their products. The Nuxe Reve de Miel Lip Balm was a recent repurchase that I'm so glad to have back in my possession. It's a thick, citrus scented lip balm that adds so much moisture. It's not the cheapest lip balm but Nuxe often have great deals on their website so it's worth checking that out and I seriously noticed the difference when my last pot ran out after about a year's use. No other lip balm works as well for me so I fully recommend this. 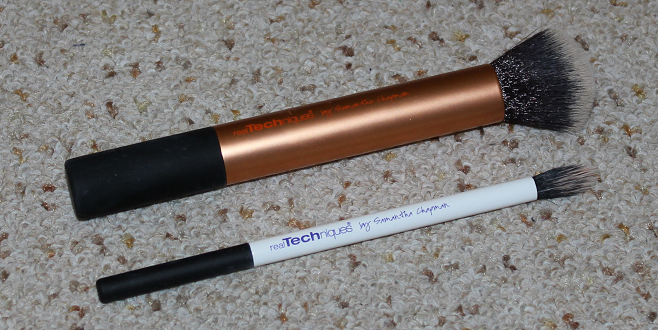 In August I was introduced to the Real Techniques brushes. I'd often lusted after them but to me, brushes aren't the most exciting purchase so I always put off getting them. After several Twitter discussions where people were raving about pretty much all of their brushes, I decided to take the plunge and picked up the Duo-Fiber set. I'll be honest, so far I've only used one brush from this set and it's the Eye Brush which I haven't used as an eye shadow brush. I was looking for a brush to apply under eye concealer as I feel like applying it with my fingers takes too much of the product off but this brush is amazing for blending my concealer in perfectly and leaving me with a higher coverage finish compared with fingers. Not long after my first Real Techniques purchase, Boots decided to put a buy one get one half price deal on their brushes and sets so not one to miss out, I ended up with the Core Collection and Starter Set as well. Again, I've been naughty and only gotten round to trying one of the brushes and it's the Buffing Brush but wow, I totally see what all the fuss is about with this brush. The super soft bristles that are densely packed give my liquid foundation application a very flawless finish. This has blown my Sigma F80 right out of the water. My makeup favourites this month are dominated by bareMinerals which I've recently discovered through QVC Today's Special Value sets. I'm not one for wearing foundation on a daily basis but when I had my really spotty phase at the beginning of the month, I really got into using the bareMinerals Original SPF15 Foundation in Fair. The coverage is surprisingly good and the finish is not powdery at all. It's perfect for a natural daytime look that feels light on the skin. 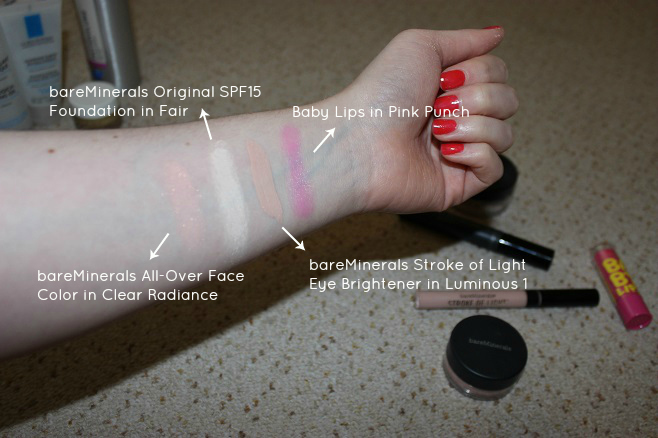 I've been loving the bareMinerals All-Over Face Color in Clear Radiance for adding a natural glow to my skin. Blended out over the cheeks, it gives you a luminous look without looking like a glitter ball so this is another product that's great for daytime use. I've found my new favourite mascara in bareMinerals Flawless Definition Mascara, the perfect mascara for separating the lashes as well as adding length and volume. The brush really gets into all of the tiny lashes that can be hard to reach. I find it's great for coating the bottom lashes too. The bareMinerals Stroke of Light Eye Brightener in Luminous 1 is the best concealer I've found for under my eyes. On the photos it looks quite dark compared to my pale skin but it blends in to my skin so well. It's peachy colour really helps counteract the darkness under my eyes and despite it's good coverage, it feels really light and velvet like. It doesn't crease under my eyes either. Somehow it feels cooling and soothing on application too. 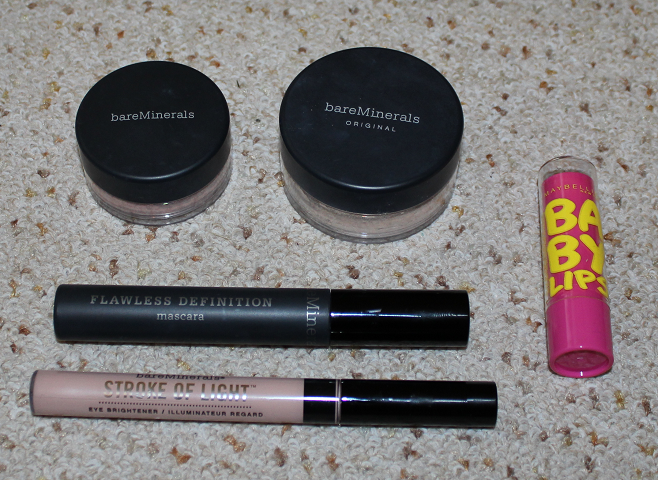 So as you can tell, I'm totally loving bareMinerals and would love to try more of their products. 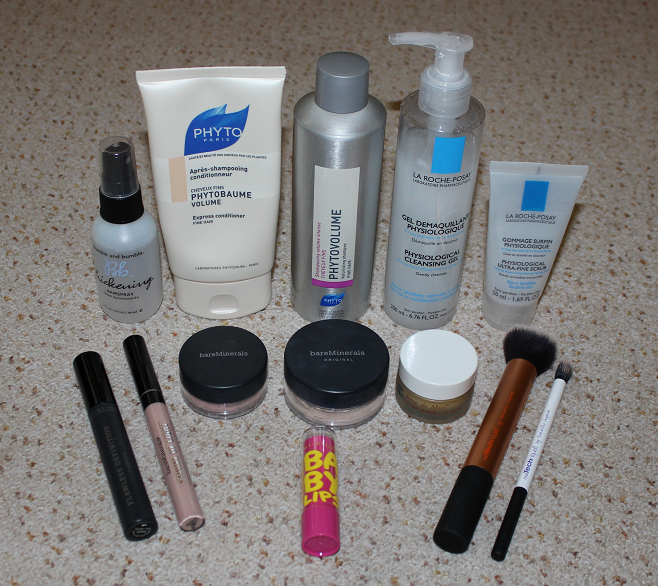 I have a post here that features these products and you can see it applied to my face too. Last but not least in my favourites is the Maybelline Baby Lips lip balm in the shade Pink Punch. I have all 6 of the Baby Lips currently available in the UK but Pink Punch is the only one I've tried so far. It's not the most moisturising lip balm ever but it certainly does a decent job at adding a little hydration and gloss as well as a really pretty pink colour. I was surprised at the coverage of this as it really does turn my lips a gorgeous pink shade. I'm looking forward to trying the rest of my collection but I know from what I've read on other blogs, this is likely to be the best of the bunch. It's been fun discovering all these fab products in August, who knows what September will bring! What products were you loving in August?